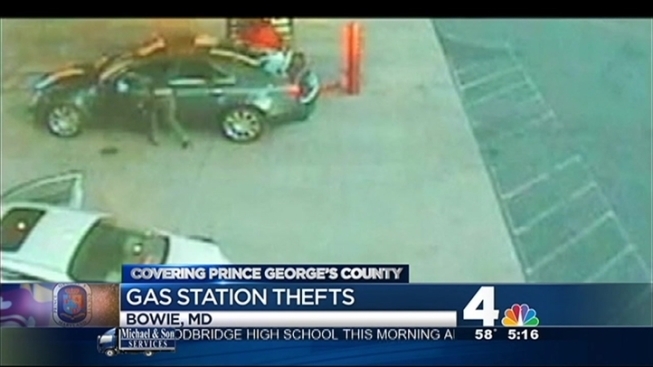 While the victim is pumping gas, the suspect opens the door on the unattended side of the vehicle and steals their purse. Police say the crimes happened at the Safeway gas station on Fairwood Parkway. According to surveillance video from the gas station, the crime only takes a few seconds, and the thieves are gone before the victim turns back around. Officers will be out in the Bowie area Monday to post flyers and warn drivers about the thefts. Similar thefts have been reported from Houston to Miami. Back in August, NBC's national investigative correspondent Jeff Rossen reported on the crime trend that police called "sliding" because the crooks slide below the eye level of the vehicle's door to commit the thefts.